Guys, trust me: if you find yourself in Morocco, one of the coolest adventures you can add to your itinerary is a Fes to Chefchaouen day trip. This was, in fact, how I decided to spend my 24th birthday in December, and I have absolutely zero regrets! Getting to flounce around the blue walls of Chefchaouen in my twirly white dress (yes in the winter time – fight me) – it was a long time dream come true! And since this amazing birthday adventure, I’ve had a lot of folks on Instagram and Facebook ask me how to actually get to Chefchaouen… which is a totally valid question, given that everyone seems to descend upon this Instagram-famous town, take a million photos and then #TBT for ten years, yet not offer up any substantial information on how to actually get there. Don’t worry though, it’s actually quite simple. the actual process of finding out how to get to Chefchaouen from Fes and deciding all the logistics required a lot of asking around, squeaking in broken French and loads of sweating and uncertainty. 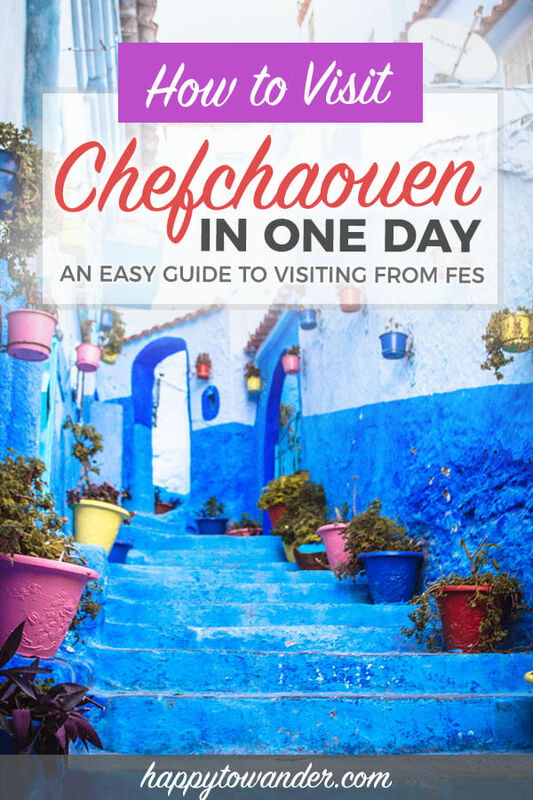 To save you the trouble, I decided to write up this handy guide on how to visit Chefchaouen in one day from Fes. It’ll be a long day, but totally doable and enjoyable. NOTE: Again, my visit was in early December. I’m not sure if bus timetables or schedules change depending on the season, but everything written here is a reflection of my trip during December 2017. Private tour (booked in-person at your riad, hostel or hotel): Morocco is a wonderful country where everyone seems to mysteriously “know a guy”. All the businesses work really closely together, which is lovely and convenient. Upon arrival, you will have zero difficulty finding someone to book you a tour to Chefchaouen, whether it’s someone working at your riad, someone working at a nearby restaurant or probably even random dudes on the street. If you want a tour, it CAN be arranged… but it will cost you. No matter what, a private tour will always cost more than public transit (which is absurdly cheap). That said, for a bit of perspective, a private tour in Morocco is still very affordable compared to private tours in other popular tourist destinations, so it depends on how much you value convenience. Public transit: This was the most affordable route, and the way I decided to do it. Sadly there’s no such thing as a Fez to Chefchaouen train, but the bus is a great option! The Fes to Chefchaouen bus I took with CTM was not only affordable, only 75 dirhams each way, but also very clean and easy. The journey took approximately 4 hours. I’ll explain the process in more detail below. If you plan to do a day trip from Fes to Chefchaouen by bus like I did, here is some useful information to know. This is very important to know. Fes has (I believe) three bus stations and which one you go to will depend on which company you book with. I went with CTM, which may be marginally more expensive (equivalent of less than $5) than some of the other local companies, but the service was very clean, very reliable and they have a sleek website with timetables and information. You can easily take a taxi to the CTM Bus Station, just make sure he’s taking you to the CTM bus station. 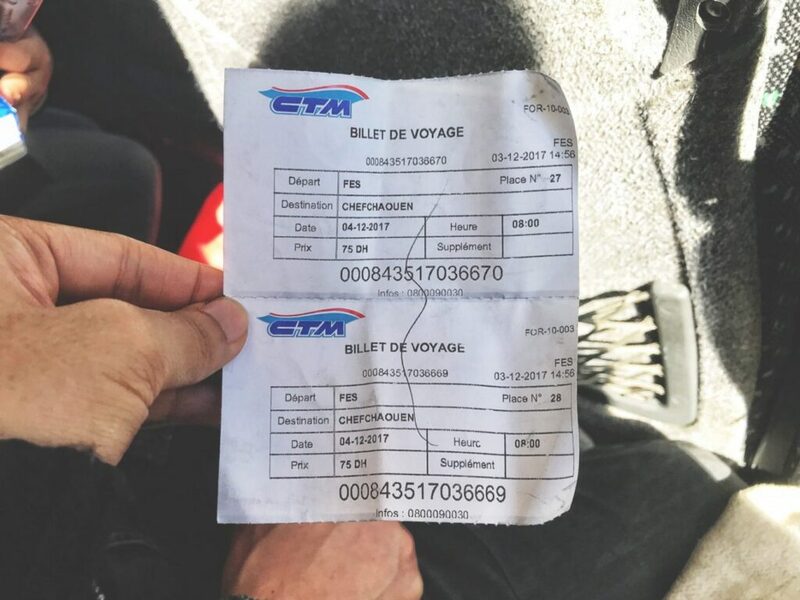 Confirm with the driver in French: CTM sounds like “SAY TAY EM”, NOT Gare Routiere. That’s not the right one. Alternatively, you can visit the main bus station (Gare Routiere) and look at the local ticket offices there. A few different companies offer the Fes to Chefchaouen route, but they don’t have websites so it’s a “pop in and see” sort of situation. Worst comes to worst, the Gare Routiere has a little CTM window where you can get CTM tickets if you can’t find any other bus companies that suit your needs. Remember though, CTM buses depart from their own station. This is the most frustrating part of the process. Basically, to buy tickets, you need to do so at the bus station, usually at least the day before. This is stressful because buses fill up quickly. So, my advice to you is to plan your Fes to Chefchaouen day trip for the middle of your stay in Fes, so that way you can secure your tickets immediately upon arriving in Fes. But wait, can you get tickets in advance…? Well……. Apparently, this can be done… but like many things in Morocco, it’s complicated. The CTM website has a very sleek system that allows you to purchase tickets, but payment is only possible with a Moroccan bank card or with something called “AKIPass”. I tried to test-buy a ticket just now with AKIPass to see how it works, but it wouldn’t authorize or let me pay. A few online forums say that you can’t buy these tickets online outside of Morocco, which sounds silly to me but is possible. If you want to try your luck, here is the English website. If you’re mega Type A like I am and die at the thought of risking your dream trip to the last minute, there are some interesting services that (for a fee) will help you buy your tickets on the CTM website (they use their own Moroccan bank cards). One such service is MarrakechTickets. The service fee is 75 dirhams though, which is literally the price of the ticket from Fes to Chefchaouen. If you don’t mind, and would rather pay double for a guaranteed ticket, then this might be an option for you. While I’ve never used this service myself, they have been featured in Lonely Planet so I doubt they’re a scam. 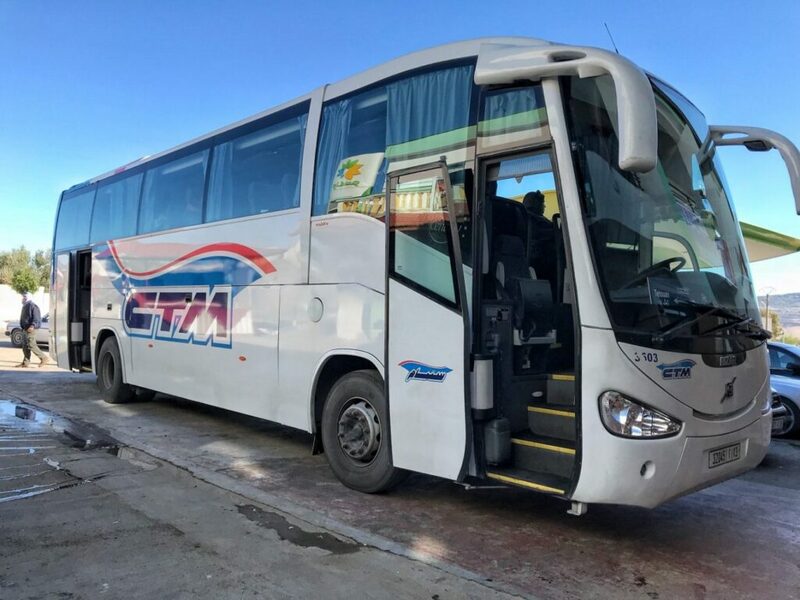 Getting back from Chefchaouen to Fes is pretty simple and straightforward as well, but one thing you need to know is that you MUST get your tickets in advance at the Chefchaouen CTM Bus Station. You can’t just grab them on the bus, or when the bus arrives. I luckily got my tickets in advance, but there was a group of really scared/red-faced backpackers who had to sprint into the station to get tickets while the bus driver was loading up luggage. He point blank refused to let them buy tickets on board, so be prepared for that. NOTE: What I did was I walked into the ticket office right as I arrived in Chefchaouen and bought my return ticket back. This took a long time because the guy was not in the office and one of his colleagues had to go flag him down. Overall it was kind of awkward and nerve-racking, especially because we didn’t know the availability, but we lucked out and got seats on our bus of choice. The CTM ticket office is located in the station, which is kind of hidden as well. Look for a house-sorta structure that’s slightly uphill from the bus parking lot. Once inside, look for the CTM sign below to buy your tickets. Yes, the CTM “office” is basically a broom closet. Alright, now that we’ve gotten you there, you might be wondering about the top things to do in Chefchaouen. Explore the town: by a landslide, the medina is the most popular out of all Chefchaouen attractions. This is the blue bit, and yes it is as blue as you see in the photos. So blue that you might expect the Blue Man Group to randomly emerge from the shadows. I could give you a list of the best photo opps, but one of the best things to do here is just explore and discover the place for yourself. The medina may be maze-like, but it’s small, and you’ll inevitably begin to see all the spots from Instagram. Get a good view: Walking uphill from the Medina is where you’ll find a great viewpoint, on the hill near the Hotel Atlas. 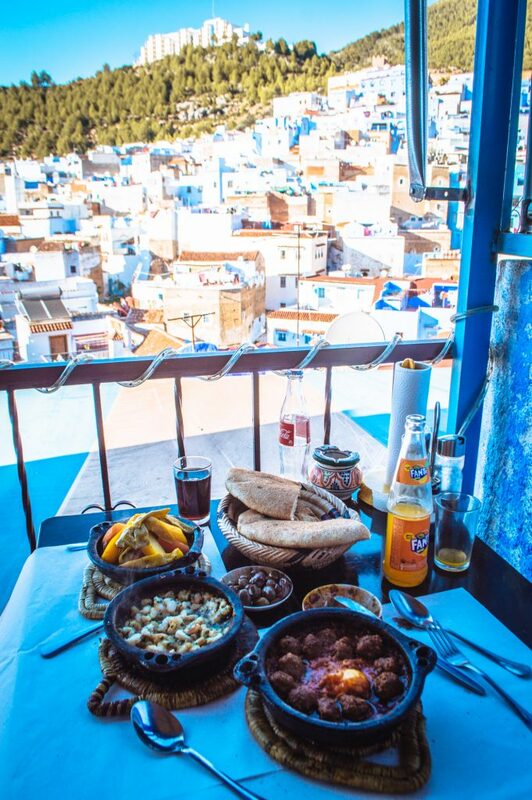 This is where you’ll find an incredible, droolworthy view of Chefchaouen. I’m not sure if I pursued the best route. I just followed Google Maps, which brought me through a winding maze of local homes and confused children. Regardless, come here for sunset if you can, because it is spectacular. You might even say it….. blue me away. Enjoy some shopping: Shopping in Chefchaouen is, generally speaking, less stressful than in Marrakech or Fes. Maybe it’s all the hash (which yes, can be purchased! ), but the shopkeepers are definitely more laid-back and won’t aggressively hound you as much as in the other major cities. I did notice the “starting prices” (pre-haggling) were higher than in Fes, but maybe that’s the price you pay for some peace haha. Walk to the nearby waterfall: Okay, it’s not a huge, spectacular waterfall by any means, but the Ras el-Maa waterfall is still quite a lovely place, and an easy walk from the medina. Given that the commute back and forth is so long, you should try your best to get the first bus out. Based on the CTM schedule (Jan 2018), the first bus from Fes to Chefchaouen leaves at 8am (for a 12pm arrival), and the last bus from Chefchaouen to Fes leaves at 6pm (for a 10pm arrival). 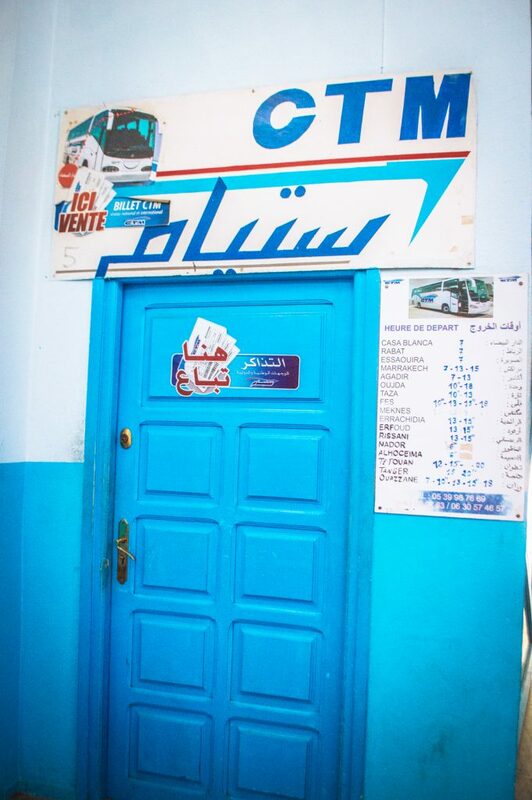 8:00am – take the bus from Fes to Chefchaouen at the CTM bus station. 3:00pm (yes this was a very long and leisurely lunch) – continue to explore the Medina, maybe stroll over to the Ras el-Maa waterfall. The part of the medina that leads to it is really lovely. Get to know some basic French before you go. French will be much more useful to you than English in Morocco, especially when interacting with taxi drivers, bus drivers, bus ticket salespeople, literally anyone. Knowing French saved me a lot of stress and grief, so having some of the basics down will help a lot. Chaouen IS Chefchaouen. Sometimes you’ll see Chefchaouen shortened to Chaouen (on signs, at bus stations, etc.) Don’t get confused, they are definitely the same place. The Chefchaouen CTM Bus Station is not THAT close to the main beautiful blue town bit (the medina). You will need to take a taxi to get to the actual blue bit. Sure you could walk, but it’s 15min solid uphill and not particularly scenic. A petit taxi from the CTM Bus Station to the Medina should not cost you more than 20 dirhams (about 2 bucks). It’s definitely worth it! Odds are good that some drivers will try to charge you more. If that’s the case, you can always just grab another taxi – there’s plenty in the area. There aren’t THAT many things to do in Chefchaouen apart from wandering the town and taking photos. Listen: Chefchaouen is great, but it’s mainly just an unusual and beautiful destination, built for meandering. The town itself is rather sleepy and there’s not too many activities or attractions to enjoy… just food and beautiful photo opps in abundance 😉 Not that I have any issue with that. Not the entire city is blue. 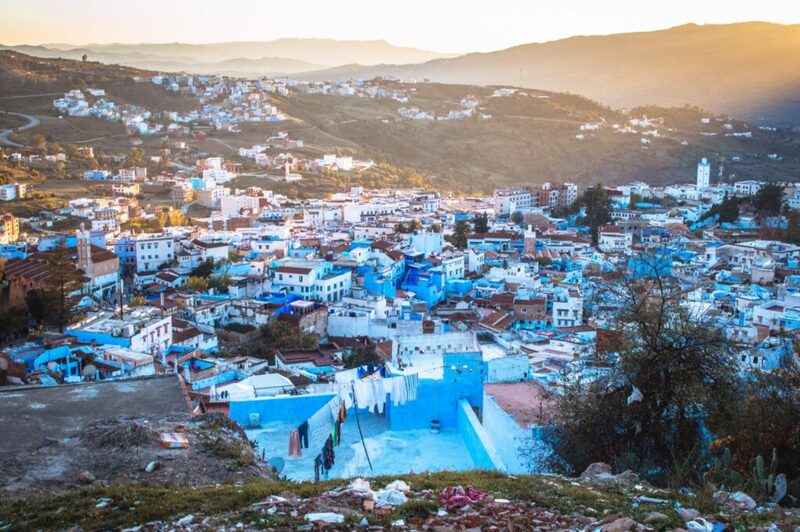 The iconic blue facades of Chefchaouen are only in the medina part of the city, so make sure that’s where you head during your day trip from Fez. And so, I hope you enjoyed that lengthy guide on planning the perfect Fes to Chefchaouen Day Trip! If you still have any questions about the journey, feel free to ask away in the comments. Great post! I didn’t bother with looking up public transport and booked a small tour. The plus to that was that we had stops to take in the scenery around the Rif Mountains, and we got to ask our driver a lot about life in Morocco. And, I agree. Chefchaouen is the attraction. A place where ambling about with real no destination is how to enjoy it. I’d go again if I get back to Morocco. I never visited Morocco before mostly because I preferred to visit Italy, France, Spain or another developed European country. Reading your post about Fes and seeing these gorgeous images, I think that I will visit Morocco next summer (in 2019). Thank you for providing me the info necessary to convince me to visit Morocco. 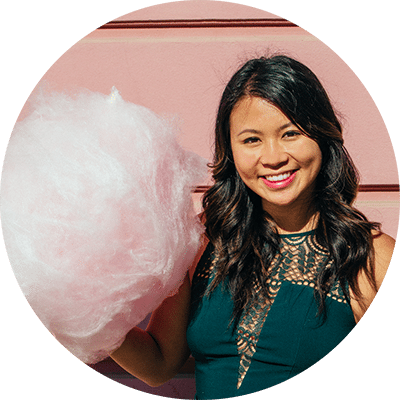 Just wanted to let you know that I went to Chefchaouen last weekend and used this blog post as my bible! It was so so helpful with planning logistics (literally the most helpful source I could find) and my day following your itinerary could not have been better 🙂 thanks for the great post!